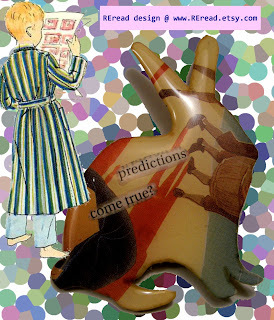 The dwarfish goose went to ... this week there is a clairvoyant bunny to giveaway. For Brisbane readers you may be interested to know that some of the brooches that are kicking about the Museum of Brisbane store were in Map magazine this month. Yay me. So if you have a copy lying around the house or work (if you’re reading this on your lunch break) flick to page 60 for a squiz. I bought fairy lights on the weekend. They have been haphazardly arranged on my front deck. That’s about as Christmassy as I get. And I plan to leave them up well after Christmas as I just like pretty coloured lights. My brother and his Finnish lass sat on the front deck last night smoking skinny Thai cigarettes watch a possum eat grevillea flowers under the dapple fairly light glow. In gleaming rays on the turkish delight. filled with rose-infused goodness, there eats - the Dong!" With no bark and no bite"
Ooooh... this isnt very good work at all... much tougher this week...but fun none the less.